Description: The Fornax come from a planet with very low gravity. This means they have to remain inside small robotic shells whenever they leave their planet. There is a screen inside they use to see. Their shells are identical, with each side being two feet wide. 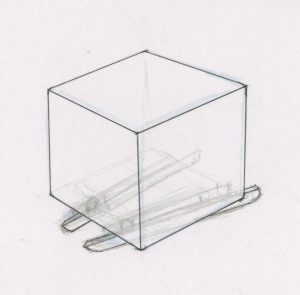 Underneath each cube, two long skate blades (which work like speed skater clap-skates on Earth) move them around. Long tube arms extend out the sides, which let them hold a hockey stick. Their hockey numbers are inside their logo on the top of their shells. Culture: Very little is known about Fornax history or culture. Nobody else in the entire universe can survive on their planet, so nobody had seen a Fornax outside of its shell. However, the Fornax are incredible scientists and engineers. Their robotic shells, spaceships, and technology have made them known as the best builders in the universe. Scouting Report: The Fornax use math everywhere, and hockey is no exception. They are always figuring out the right angles for passes and shots. They are without question the best passers in the universe. However, their small size means they can’t check or be physical against bigger species. But that doesn’t mean you should take any penalties against the Fornax. Their power play is absolutely lethal thanks to their precision passing. Fun Fact: Fornax goalies don’t use a stick. Instead they are allowed to use two catching gloves. Their shell also comes with longer legs, so that it can reach up to block the top corners of the net.